In another life I was a high school science teacher and my favorite subject was physics. I was pretty good at teaching mechanics and heat but less successful at explaining things in the less easily observable world of light, sound, and atomic theory. In an attempt to do this I often tried, occasionally succeeding, to relate things to the observable world. As background it is important to know that through the years the concept of how an atom is constructed has changed. The Greek philosopher Democritus initially surmised that things could not be divided ad infinitum because if they did then everything would be made up of the same substance, there had to be a small part that distinguished one type of matter from another. J.J. Thompson proved this when he discovered the electron, a smaller part of the atom, a few millennia after Democtitus first made his suggestion. On the heels of Thompson’s research Ernest Rutherford theorized that electrons were uniformly distributed in the atom. The Danish physicist Niels Bohr, a student of both Thompson and Rutherford, theorized in 1925 that electrons circled the nucleus of the atom in much the same way that planets orbit the Sun, although the electrons are in different planes. The work was so important that, to this day, a sketch of the orbital model is used as the universal symbol of atomic energy. Bohr’s work, which won him the Nobel Prize for Physics in 1922, was instrumental to the development of the current atomic theory of quantum mechanics. George Gamow, a Russian-born American physicist whose theory titled “Space – the Big Ball of Fire” has come to be popularly known as the “Big Bang Theory” was a colleague of Bohr’s and relates this anecdote about the depth of the mind of the Danish Nobel laureate. 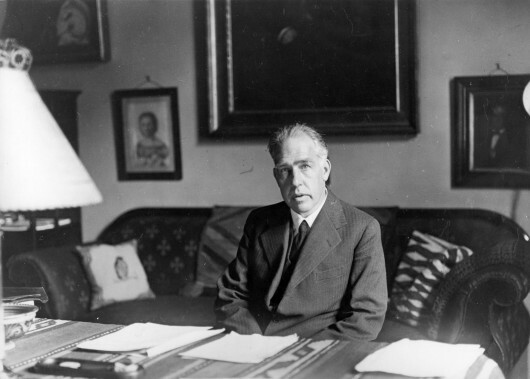 “The evening work in the Institute’s library was often interrupted by Bohr, who would say that he was very tired and would like to go to the movies. The only movies he liked were wild Westerns, and he always needed a couple of his students to go with him and explain the complicated plots involving hostile Indians, brave cowboys, and desperados, sheriffs, bar maidens, gold-diggers, and other characters of the Old West. If I let my imagination run free I can see the standoff. The middle aged physicist facing his post doctoral research assistant, Mattel six guns slung low, white lab coats reminding me of linen cattle dusters, two men facing each other in an imagined western main street made up of lab tables cluttered with retorts, oscilloscopes, and ring stands. The old man’s hand hovers above the white plastic grip of the six-shooter while his eyes stare unblinking at the twitching hand of the junior scientist. Much like the terrified town folks in any Saturday matinee movie oat burner of the 40s or 50s the rest of the lab staff looks on, peering behind the perceived safety of raised clipboards, index fingers poised over stopwatch buttons, and pens raised to record data. In a flash the post-doc moves, the old man responds, lab assistant index fingers spasm twice-starting and stopping the timepieces, and pens scratch numbers on graph paper. Good science requires that the experiment be repeated until an adequate data base is built. After numerous replications the staff retires to lab stools, studies the data, and concludes, based on empirical data, that a second Bohr’s Model is ready for release to scholarly journals. What Bohr addresses, for the interest of the shooter, is the simple fact that much of the success of shooting is developing a conditioned reflex. Once you have the mechanics down and have fired enough good shots to condition your trigger finger to move when the sight picture is that of an X then you will find that good shots just seem to happen. If you want to take much from this article then you have to apply these techniques to your won blog.